LWA stands for LTE-WLAN Aggregation. It is a kind of technology on the evolution path of LTE Unlicencesed technology. You would get the overview of LWA under the context of LTE Unlicensed technology, refer to LTE-U/LAA/LWA page. I decided to create a separate page for LWA since the technical details will be too long to put in the overview page. I will describe the details of the LWA based on 3GPP documents in this page. However, it will take very long before I complete this page because this technology is at very early stage as of now (as of Jun 2016) and I haven't seen any real implementation of this technology personally. 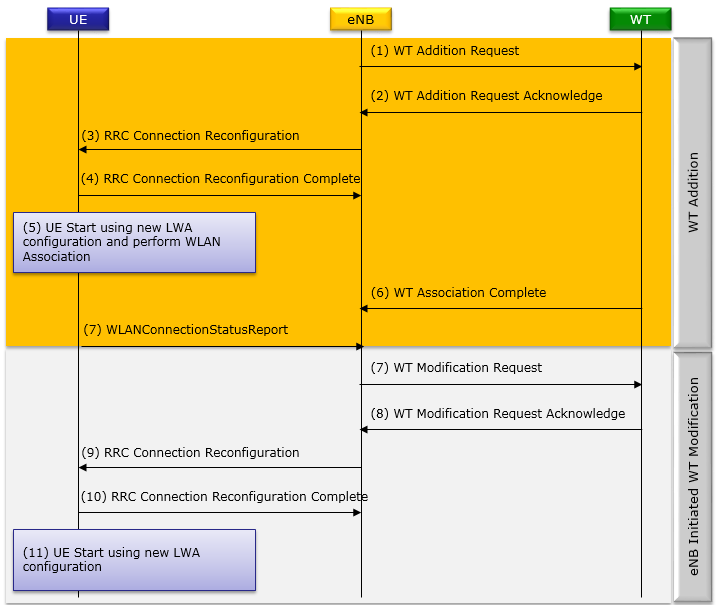 Following is overal network architecture of LWA. As you see here, there can be two different type of scenario(implmentation) of LWA. One is called 'Colocated scenario' and the other one is called 'Non-Colocated scenario'. Regardless of the scenario, one common thing is that the data is split at PDCP layer of LTE and forwarded to LWAAP (LWA Adaptation Protocol) which in turn forwarded to WLAN MAC layer. The difference between the two scenario is the location of WLAN MAC/PHY. In Colocated scenario, LLAN MAC/PHY reside within the eNB (i.e, in the same location of LTE Radio Stack). 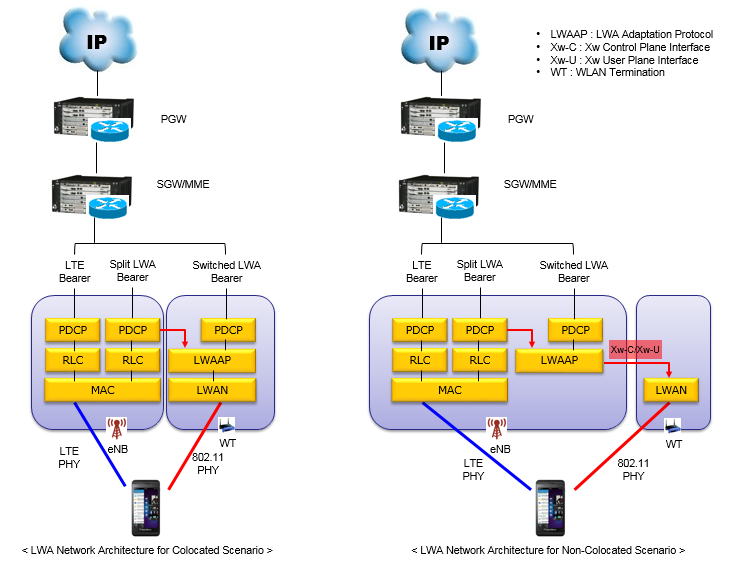 So LTE PDCP can directed connected to LWAAP and it does not need any special interface between LTE and WLAN. On the contrary, in non-colocated scenario WLAN MAC/PHY resides out side of eNB, so they need special interface called Xw (Xw-C and Xw-U) to convey the control and user data between LWAAP and WLAN MAC/PHY. 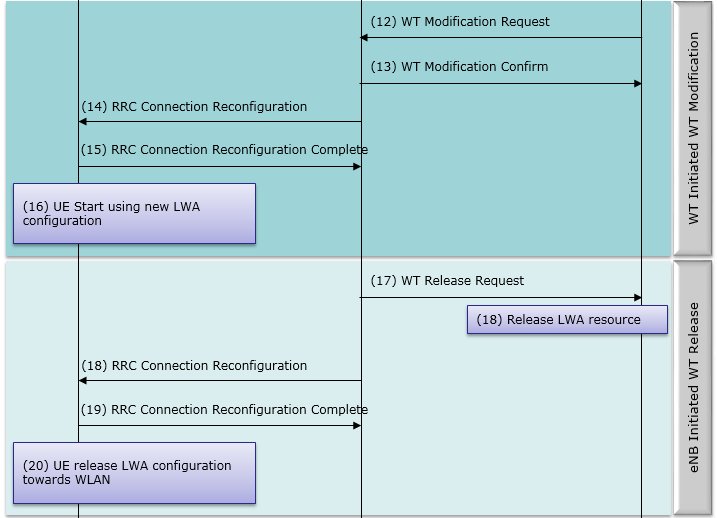 Following is overall protocol sequence for LWA operation. As you see, there are roughly 3 types of operation as listed below.